low-income adult residents of Wabash County. **Closings due to weather will be posted on our website and Facebook page. ​April 11: Open to all of Wabash County: Diabetic-friendly Party, Thursday, April 11, 5-8 pm, 85 HOPE waiting room. Hosted by Manchester University students! Food, education, presentations on how to life a healthy life with diabetes! FREE! Anyone in Wabash County is welcome to join us! April 23: Manchester FREE Pap Party rescheduled for Tuesday, April 23 from 6-8 pm at the Manchester PPG Clinic on Wayne Street in North Manchester! All Wabash County women ages 21-64 are welcome to attend. No insurance, no income requirements, no appointment needed. Just come! In addition, any woman age 40 and over who attends the party will receive an order for a FREE mammogram. Plus, cookies and drinks will be served. We hope to see you there! Stop by Moonshine Cowboys Riding Club booth on the Market Street side of Modoc's on First Fridays to learn about 85 HOPE Medical Clinic and donate to our organization. We are in need of monetary donations plus donations of office/cleaning/hygiene supplies. See donations on website for list of needed items. Thank you and hope to see you there! ​Take advantage of this low-cost lab draw opportunity at Lincolnville United Methodist Church from 8:30-10:30 am! ​Now offering FREE healthcare navigation-assistance with applying for Medicaid and HIP-to 85 HOPE clients through BrightPoint. ​5-7 pm to help clients schedule an intake appointment. BrightPoint offices are located at the Bowen Center in Wabash. Clients may also contact Michelle directly for assistance at 260-445-4341. New 85 HOPE clinic site opening in North Manchester in 2019! 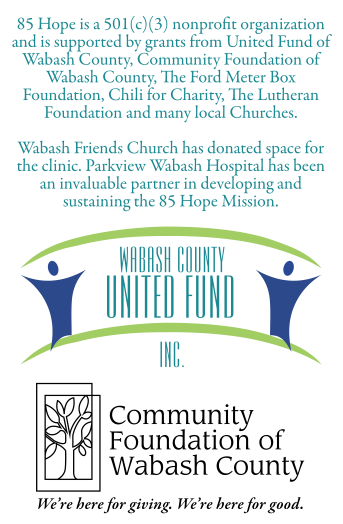 85 HOPE Medical Clinic in Wabash is located at Friends Church, 3563 South State Road 13 Wabash, Indiana, 46992. Enter the building from the South Entrance (Door 9) and follow the signs.